The year was 2003. The Yankees would win 101 games that season and capture the AL East Divison, the ALDS against the Twins, the ALCS against the Red Sox but then lose the Series to the Marlins. Coming out of that year’s spring training season, most of the reporters covering the Yankees were predicting Juan Rivera would be Joe Torre’s selection as the team’s fourth outfielder. Instead, Torre chose Chris Latham. New York had signed the Idaho native the previous September after he had spent the entire 2000 season in the Mets farm system. 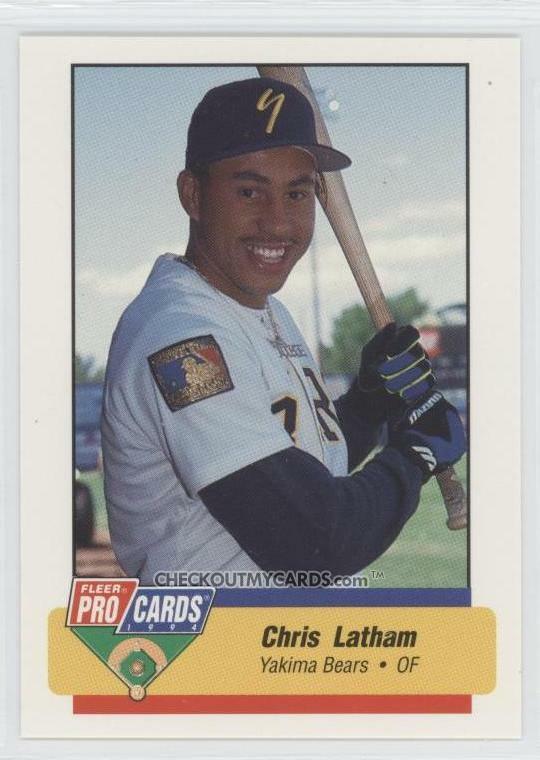 But Latham did have prior big league experience. He had made his debut in the Majors for the Twins in 1997 and saw action in Minnesota’s outfield for three straight seasons. He had also played for Toronto during the 2000 season, where he hit a career high .274 in 43 games as a utility outfielder. Reports at the time indicated Torre had selected Latham over Rivera because his speed made him a better pinch-running option, he was a switch-hitter and had experience playing center field. He made his debut in pinstripes as a pinch runner for Raul Mondesi on April 6, 2003, during the sixth inning of game against Tampa Bay. He scored a run and remained in the game to play right field. He got his first Yankee at bat three innings later and singled off Jorge Sosa. Even though Latham had made the Yankee roster, his agent continued to look for opportunities that would permit his client to play more and make a higher salary. He found such an opportunity with the Yomiuri Giants in Japan. Latham asked the Yankees if they would agree to negotiating a deal with the Giants that would permit him to play there and the team graciously agreed. Before he departed for Yomiuri, he got one more at bat as a Yankee against his old team the Twins and singled. That hit would make him the only Yankee in history to leave New York with more than one official at bat and a 1.000 career batting average. The only other Yankee born on May 26th was this former first baseman. Jason Giambi’s nightmare Yankee season of 2004 represented an opportunity for Travis Lee. The Yankee brass loved Lee’s glove at first base and all they wanted from him was good defense and decent at bats. So they signed him to a one year, two-million-dollar deal even though they had already signed veteran first baseman Tony Clark a few weeks earlier. But Lee hurt his shoulder in spring training and began the season on the DL. He ended up appearing in just seven games for New York that year. Instead, it was the switch-hitting Clark who became Giambi’s “designated glove” and started the most games at first base for the Yankees that season. Lee ended up back with Tampa Bay the following year and out of baseball all together following the 2006 season. Update: The above post was originally written in 2011. Lee left baseball because he said he had no passion left for the game. The Nationals had invited him to their 2007 spring training camp to try and win the starting first baseman’s job that was vacant as a result of one of former Yankee, Nick Johnson’s numerous injuries. Lee evidently walked into the Washington GM’s office one day and asked for his unconditional release, got it and went home. 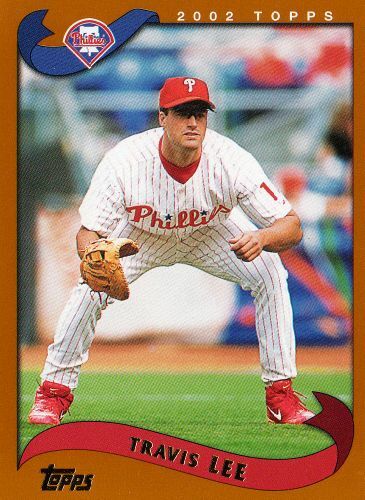 I can remember when Lee broke into the big leagues with Arizona in 1998 because that was the Diamondbacks’ very first year in the league and former Yankee skipper Buck Showalter was in charge of baseball’s newest team on the field. The 23-year-old Lee was one of that historic squad’s bright spots, belting 151 hits, tying for the team lead in home runs with 22 and finishing third in that year’s NL Rookie of the Year Award behind Todd Helton and that year’s winner, former Yankee Kerry Wood. Lee shares his May 26th birthday with the only Yankee ever to bat 1.000 during a pinstripe career that consisted of more than a single at bat.